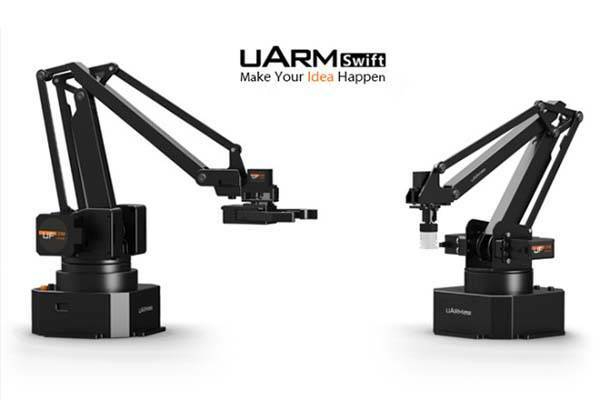 Using multiple interchangeable modules, uArm Swift robotic arm delivers various creative features, and portable design allows you to easily deploy it on your desk at home. Want to learn more about the robotic arm? Let’s continue reading. uArm Swift is an advanced Arduino-powered desktop 4-axis parallel-mechanism robot that measures 150 x 132 x 281mm and weighs 1.2kg, and it comes in a Pro version that measures 150 x 140 x 281mm a x weighs 2.2kg. 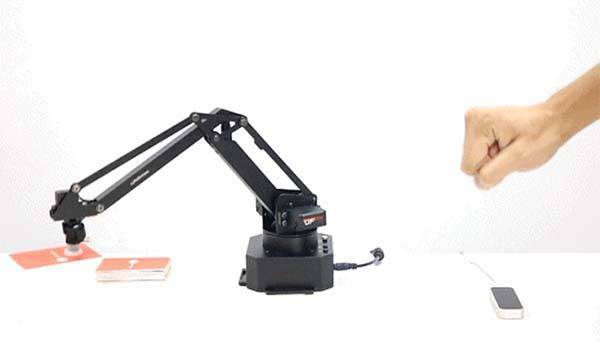 With the help of its parallel-mechanism structure, both robotic arms show off a lightweight and compact design so you can easily place either of the two on a desk, starting your great project. Meanwhile, the robotic arms are built with square aluminum alloys instead of U aluminum alloys in order to deliver a strong and light construction. The uArm Swift comes equipped with RC servos improved by adding temp sensor into the control system, and the system can always protect its DC motor for optimal performance. Compared with uArm Swift’s DC motor, uArm Swift Pro features a stepper motor and customized gearbox so it delivers more precise and smoother movement and keeps the repeatability under 0.2mm. 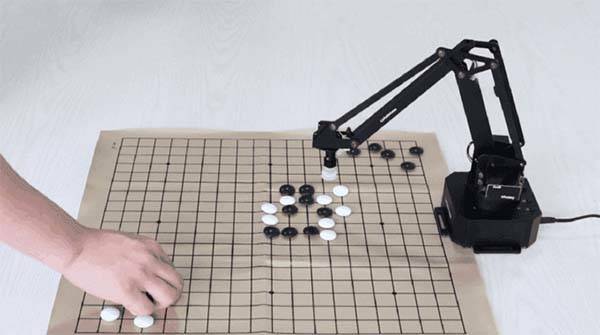 Furthermore, the robotic arm also features multiple interchangeable end-effectors including suction cup, metallic gripper and universal holder. uArm Swift/Swift Pro have a built-in socket that fits optional Seeed Grove modules including mini fan, electromagnet, motion sensor, temperature & humidity sensor, color sensor and LCD RGB backlight, so you can easily add more functions to the robotic arms. With optional Open MV Cam, the arms can help you finish complex tasks. Using built-in Bluetooth module, the robotic arm wirelessly connects with your smartphone for intuitive remote control, and uArm Studio delivers an blockly-based graphical programming platform that allows you to intuitively code your uArm Swift for various functions like claw machine, air hockey, hand written clock, 3D printing, laser engraving and more. In addition, the robotic arms are open source so developers can freely add new features to uArm Swift/Swift Pro. The uArm Swift and Swift Pro have been available for preorder on Indiegogo. You can pledge $289/$499 to preorder the robotic arm kit. Both models will be shipped in May 2017.